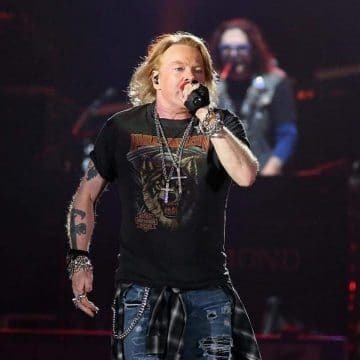 Guns N’ Roses played a shortened set by their own standards at the du Arena at Yas Island in Abu Dhabi, United Arab Emirates on November 25, 2018 due to singer Axl Rose reportedly being severely ill. It appears that Rose knew going into the show that he was feeling very ill but he elected to proceed with the concert in any case. Based on the setlist below, it appears that Rose eventually had enough as the group started skipping songs from its usual setlist including staples such as “Civil War” and “You Could Be Mine” before ending the set with “November Rain” while skipping their usual encores and classics such as “Nightrain” and usual set closer “Paradise City.” Guns N’ Roses ended up playing 17 songs (counting Slash‘s extended guitar solo) compared to their usual 28 song set like four nights beforehand at the Asia World Arena in Hong Kong. Uploaded by Tobias – on 2018-11-25.